I've previously enjoyed reading Grace Burrowes as in her Christmas themed historical romance and a serene and satisfying contemporary romance. Noah Winters, Earl of Anselm, spent months sorting and courting the year's crop of debutantes in search of an ideal bride. When the sweet, biddable young thing he selected accepts another's proposal, Noah decides to court her companion instead. Thea Collins, though, is anything but biddable. She has learned the hard way that men are not to be trusted, especially the handsome ones. When she reluctantly accepts, Noah rushes Thea to the altar before she can reveal her deepest secret. Can she finally move on from her past, or will it come back to haunt her? Noah had woken up beside his wife—again, despite all plans to the contrary—creating another first for him. Thea had risen several times during the night to tend to herself. He hadn’t realized that monthly courses caused a woman’s rest to be interrupted. Crashingly bad planning, for a lady’s sleep to be disturbed when she most needed rest. “You’re not about to steal my tea?” Thea held out the cup, her gaze shy as she sat propped against the headboard. Drat. He’d given another order. Noah piled both ham and bacon on Thea’s plate, and stole better than half of it, because he needed the sustenance too. Thea and Noah's story starts out in a way that felt, for me, unconventional for historical romances, even though it's always presented as the norm in these books - they marry for practical reasons. Now it turns out that Noah's a bit of an arse. While he's very loyal in some ways, and pretty concerned about others, when it comes to his wife, he seems to view her as a self-indulgence. When it turns out she's not exactly what he expected, he throws a bit of a temper tantrum, creating much of the relationship conflict in the book (particularly as he allows other problems to develop because he refuses to admit to and apologize for being an arse). Much of the book is spent with these two trying to get to know each other (or not), and addressing some of the roadblocks that stand in the way of their marital happiness. 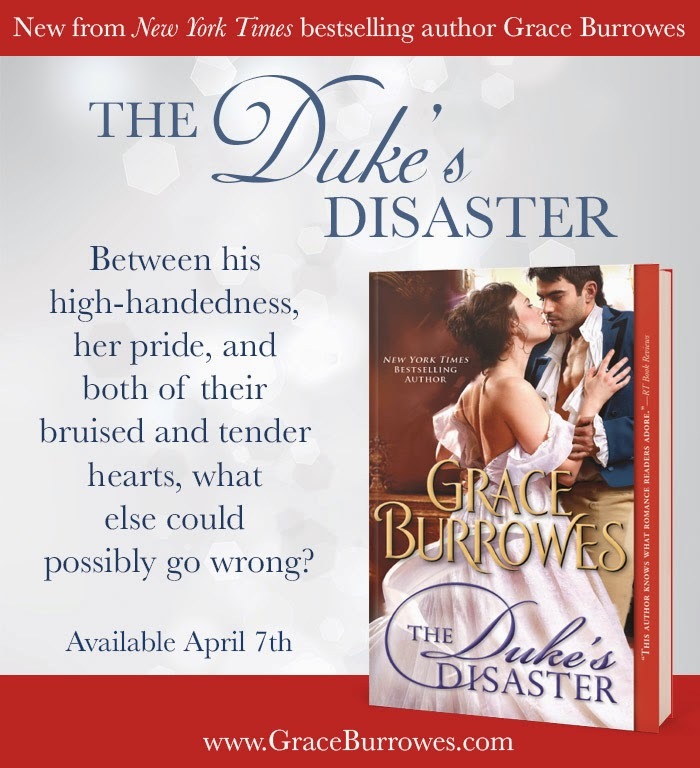 I didn't find The Duke's Disaster to be especially memorable, but I did enjoy reading it. There's some humor here, there's a romance that has a lot of inner turmoil, and there's a Duke who should have had to work harder to make up for his shoddy behaviour.